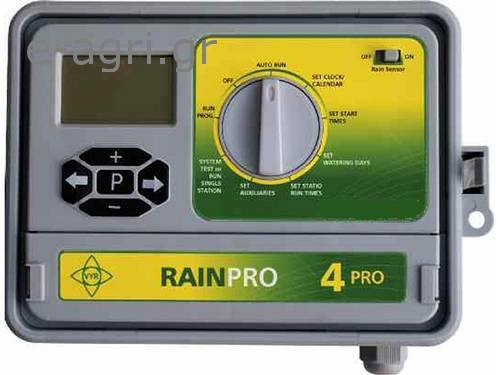 Irrigation Controller of 110/220V-24Vac power of 4, 6, 9 and 11stations with 4 programs and 6 independent starts by program that canbe overlaped. • Number of stations: 4, 6, 9 and 11 stations + main master valve. • Number of programs: 4 independent programs (A, B, C and D). • Number of initiations: 6 initiations per program. • Duration of cycle: up to 7 days. • Programming times: from 1 minute to 12 hours. • MANUAL STARTING of stations and programs. • Interchangeable Menu-Covers in 3 languages​​: Spanish, English andFrench. • Easy installation, programming and use because of its versatiledesign and logical control system. • Ergonomic keyboard with 5 keys. • Logical and easy to use digital screen. 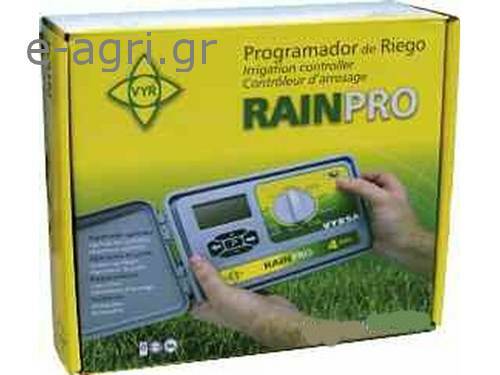 • PAUSE and SKIP IRRIGATION positions. • Water throughput adjustment between 20% and 150%. • Input for main valve activation and an input for a normally opensensor (rain sensor). • Safety system with 9 V battery for keeping track of time in case ofblackouts. • Outdoor installation box IP-65 with lock-eye. • Quick user guide on the inside of cover. • Output: 300 mA through TRIAC. • Number of valves supported: One 24 VAC solenoid per output at no morethan 300 metres distance (depends on the model and transformer). • Terminal strip: cables of up to 1.5 mm2.